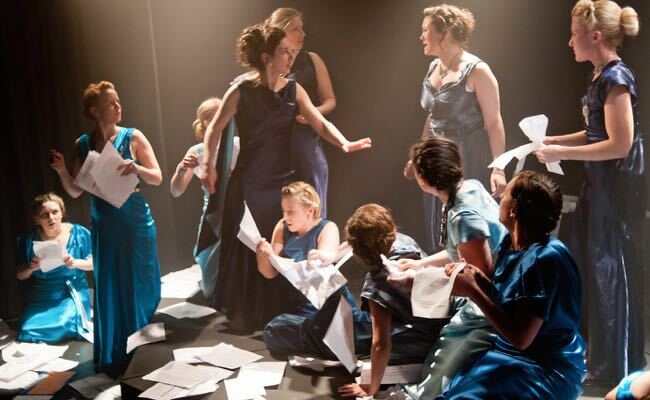 LONDON – There are moments in Katie Mitchell’s staging of Don Taylor’s version of “Women of Troy” when the fate of all women condemned to suffering by war and oppression is made sorrowfully clear. An imprisoned queen, her daughters and handmaidens raise their arms and make a melancholy dance across the floor of their functional dungeon. With Simon Allen’s mournful music, these scenes echo not just the setting of Euripides, but anywhere from Auschwitz to Rwanda. In formal dresses that make the setting timeless, the women spend their time berating a fate that has led an invading army, in this case Greek, to slaughter all their men and carry off females and children to slavery. They are confined in what resembles a warehouse basement by a dock somewhere with great cranking doors and elevators. The feeble but relentless jailors every now and then bring news of their fate. The queen, Hecuba (Kate Duchene), already knows that her husband is dead, but now the victors have come to claim her mad daughter, Cassandra (Sinead Matthews), as a concubine. They rob another daughter, Andromache (Anastasia Hille), of her son to be thrown from the battlements and later returned for a sadly inadequate preparation for a proper burial. The radiant Helen (Susie Trayling), who is not of Troy and despised by the other women, is kept in solitary confinement in a room above because of her ability to enslave men with a single glance. Her husband, Menelaus (Stephen Kennedy), arrives to take her back to Greece where she faces a death sentence (though in “The Odyssey” she eludes that fate). Taylor dispatches his tale in less than 90 minutes, and the pace sometimes affects clarity. The usually sublime Matthews is forced to scramble much of her dialogue as Cassandra seems to lose her mind and sets fires all over the stage. Duchene captures Hecuba’s struggle for dignity amid lamentations for what has befallen her country and community, while Hille and Trayling make strong contributions. There is little hope in this story, and Taylor and Mitchell’s success is in making its harrowing point so powerfully haunting. Venue: National Theatre, runs through Feb. 27; Cast: Kate Duchene; Sinead Matthews; Anastasia Hille; Michael Gould; Jonah Russell; Stephen Kennedy; Susie Trayling; Mark Holgate Playwright: Euripides; From a version by: Don Taylor; Director: Katie Mitchell; Set designer: Bunny Christie; Costume designer: Vicki Mortimer; Lighting designers: Paule Constable, Jon Clark; Movement-choreography: Struan Leslie; Sound designer: Gareth Fry; Music: Simon Allen. This entry was posted in Reviews, Theatre and tagged 'The Women of Troy', Don Taylor, Euripides, Katie Mitchell, National Theatre, Sinéad Matthews. Bookmark the permalink.